The works brought together at the Museo Correr represent more than 50 years of development in Freud’s art: the handling changes, the attitudes mature, the feelings alter within Freud’s lasting preoccupation, his concern for the individual and the particular. In its emphasis on what might be termed passionate proximity it will differ substantially from the Tate retrospective. The exhibition presents a great variety of works, some small yet grand, some large yet intimate: the curator, the writer and critic William Feaver, who was responsible for Freud’s Tate retrospective in 2002, has selected them to represent Freud at his best and most acutely demonstrate his preoccupation with the feel of things. Freud examines people, animals, plants and other objects with extraordinary intensity, avoiding symbolism of any sort. Freud himself has said, “I don’t think there’s any kind of feeling you have to leave out”. Freud’s work attracts phenomenal attention not so much because it is strikingly direct but because it has the power to move people. Unsentimental and unpretentious, it shows us and our world with touching candour. As a grandson of Sigmund Freud, Lucian Freud has always been associated with notions of psychological insight genetically transmitted, somehow. In reality he is a painter primarily concerned with the behaviour of paint, also referring back to the work of the artists he most admires –to Titian, Rembrandt, Hals, Velazquez, Watteau , Cezanne- not imitating, not necessarily emulating even, but relating to them in today’s terms. His fierce attention to everything from plant life to a dog’s muzzle, to anything from a wrinkled coverlet to the hind quarters of a horse, makes him a marvel among artists of our time, a profoundly honest, intimate, uncompromising perpetuator of (as he puts it) “the way life goes”. Organised by Musei Civici Veneziani, in collaboration with the British Council, produced with Venezia Musei, supported by Deutsche Bank, the exhibition is curated by William Feaver and includes more than eighty works, some of them established masterpieces, some new and previously unseen. Catalogue Electa. In the fifty years since he first exhibited in Venice Lucian Freud’s fame as a painter has matured into pre-eminence. Three years after the retrospective held at the Tate in London in 2002, a number of new and previously unseen paintings by the 82 year old artist will form the finale to the exhibition at the Museo Correr, coinciding with the 2005 Biennale. Most of the loans for the exhibition come from collections in Europe and the United States. They include the Portrait of the Queen, from the Royal Collections, lent for the first time, and a number of paintings never before publicly exhibited. “Everything is autobiographical and everything is a portrait”, he has said. 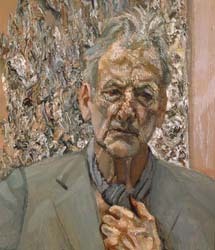 The subject, whether friend or acquaintance, lover, daughter or grand daughter, whether fellow painters – such as Bacon and Hockney – or the Queen of England or indeed himself, becomes uniquely Freudian: his paintings represent his life .Those closest to him as painters, from Graham Sutherland and Francis Bacon decades ago to Frank Auerbach, over the past thirty years, have affected him in terms of attitude but not in terms of style or approach. Like Bacon, Freud has always aimed to go beyond appearance. Unlike Bacon he does so by concentrating on specifics.